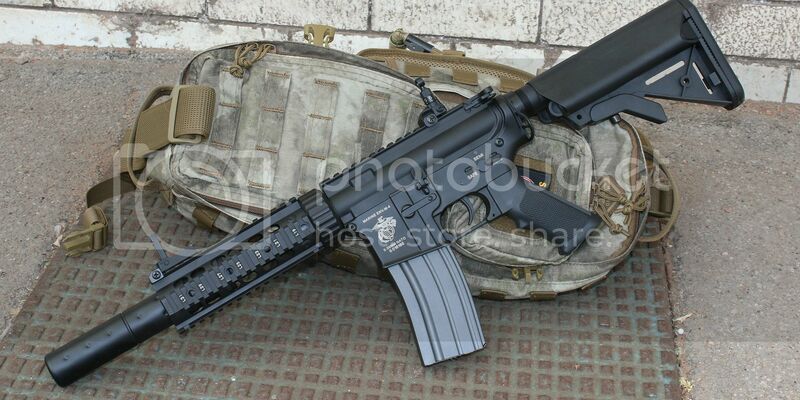 As airsofters we are bombard constantly with new versions of the ubiquitous M4 carbine. 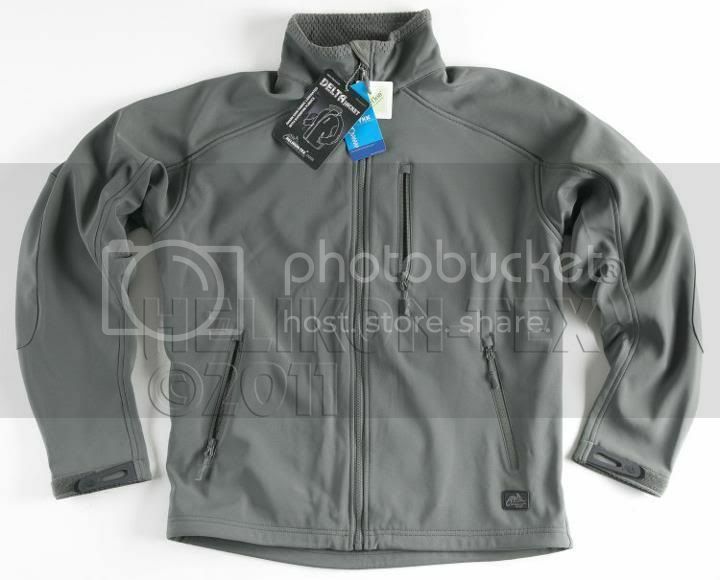 So when a new one comes along it has to be extra special and at a good price to get any attention at all. So what do we make of the Specna Arms SA-A07 carbine? 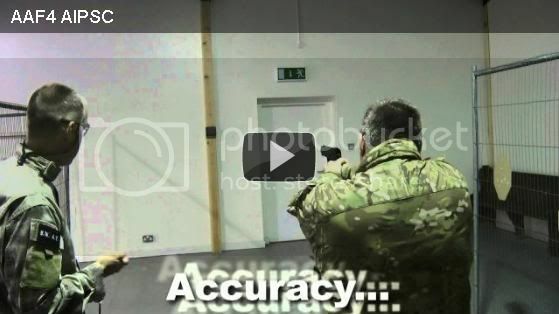 Firstly who are Specna Arms? Relatively new to the airsoft market, Specna Arms promise to deliver a series of brand new replicas to the marketplace at a competitive price, in rarely encountered version/configurations with features such as working bolt catch, laser engraved markings and trades, plus anodised receivers. Looking through their available model range you’ll find something in the M4 range for sure to take your fancy – this time around we are checking out their SA-A07 carbine for review. The box is an unassuming brown package design with a large Specna Arms label on the front but once you open it you’ll notice the nice ‘additions’ they’ve added to the package which includes a 9.6v Ni-MH 1100mAh battery, cleaning rod, high cap magazine, lanyard and a spare main spring for your AEG. 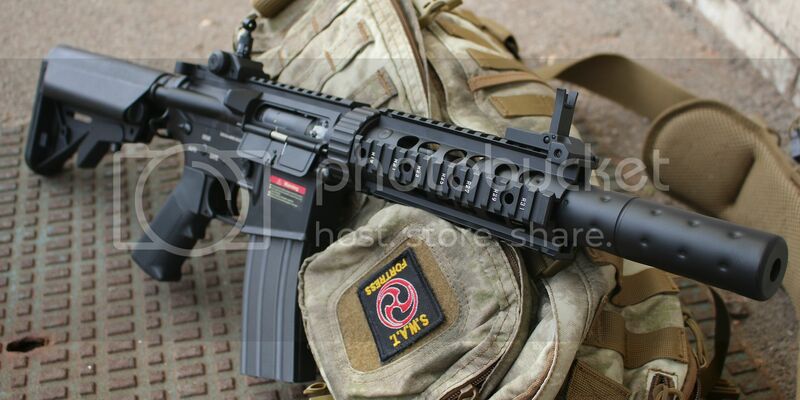 Well I say ‘spare’ but the AEG is fitted with what SA refer to as an ‘Enter & Convert’ system. Which in essence is a quick change main spring following the normal twist and quick change model. 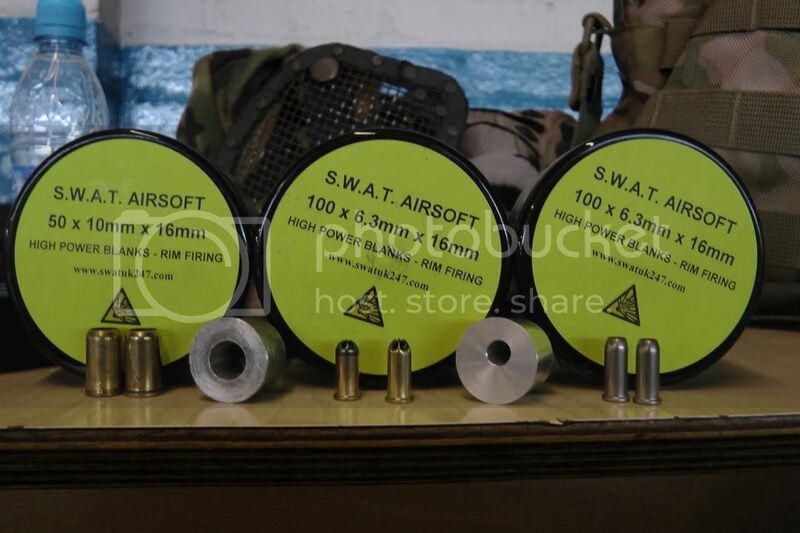 This means you can down grade quickly between lower powered springs for CQB games or a more powerful spring in woodland skirmishes, if your sites allow a difference between the 2? 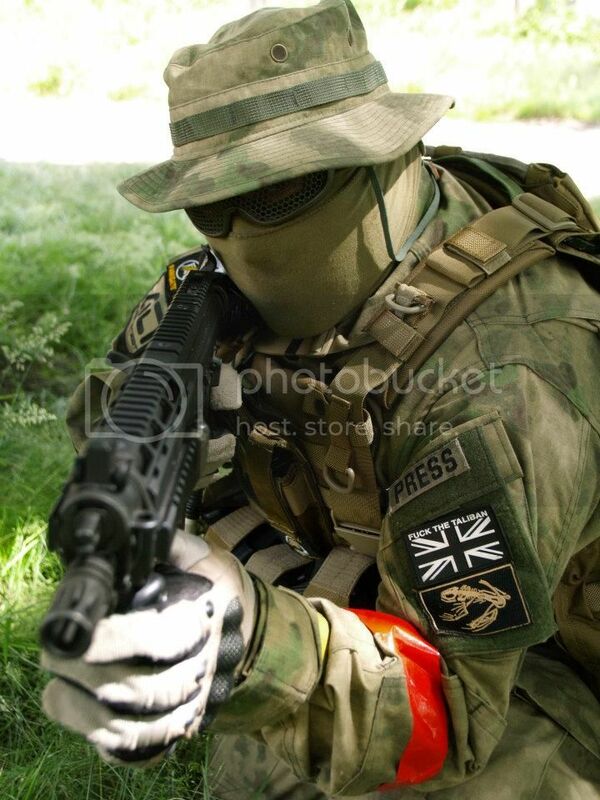 (generally in the UK CQB sites are a lower FPS than woodland sites due to the close proximity of players). The package also includes a charger and a small packet of BB’s – both of which as usual I wouldn’t waste any time on – remember to always use a quality charger and BB’s if you want to protect your investment in your equipment, this applies to most AEG’s with included charges but it is a nice touch should you be on a strict budget and can’t quite afford a separate charger when first starting out. Pulling the AEG from its polystyrene box, I still get that degree of excitement like any bloke with a new toy to play with! Heft, feel and what I call ‘pointability’ it certainly satisfies on those counts. As for looks it’s one of the better AEG’s straight out of the box. This model comes standard with an ‘in built’ suppressor look, adjustable 5 position stock, full front RIS, metal receiver and adjustable rear sights. The upper and lower receiver is metal with a functioning bolt catch for those that like the lock & load treatment with laser etching on both sides. 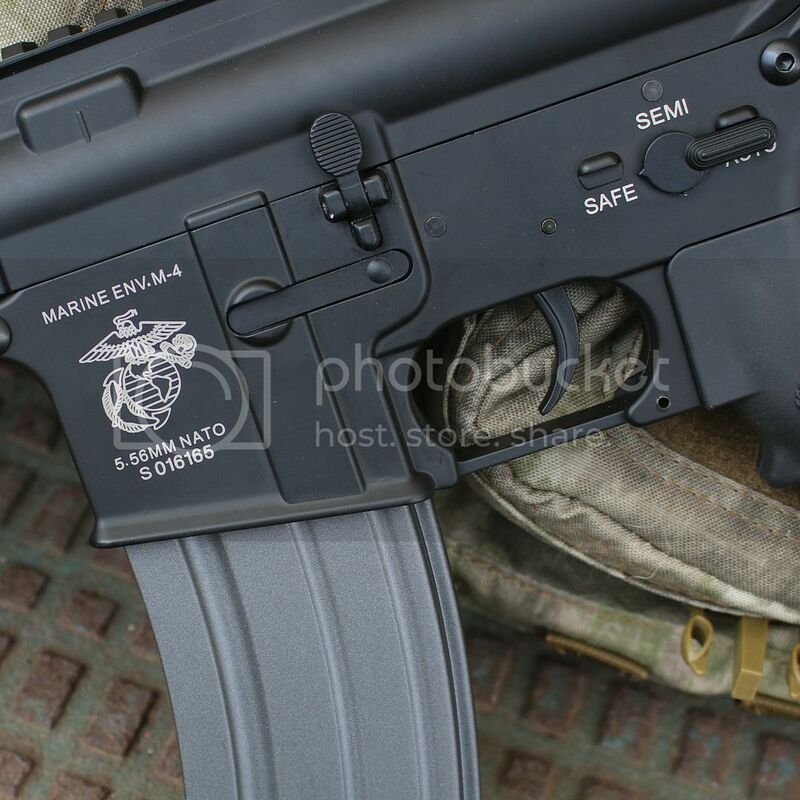 The LHS has the fire selector with the markings in large lettering whilst the magwell has a passable Marine Corps logo emblazoned on it, along with 5.56 NATO and a serial number marked underneath it. The RHS is plainer with no fire selector but does have a small Specna Arms Industries marking near the top of the lower receiver and the markings for the fire selector – handy if you decide to customise with an ambi fire selector at a future date. 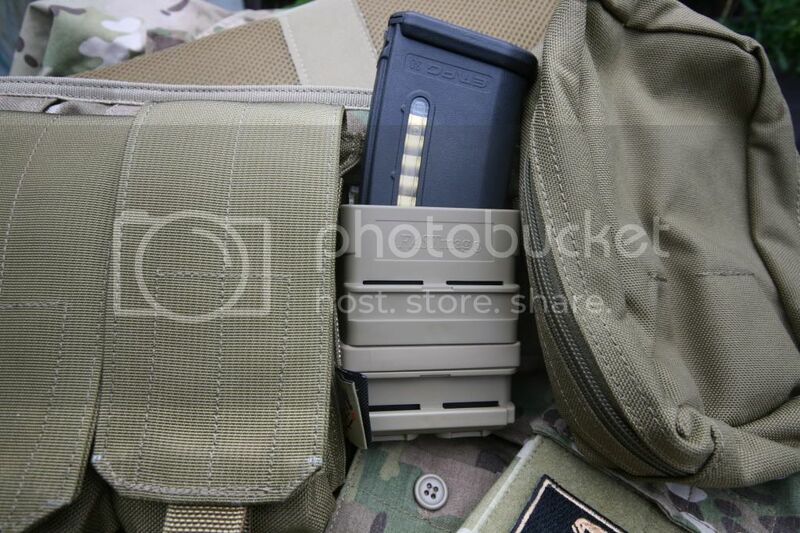 As usual the charging handle releases the dust cover and has a working bolt catch as mentioned earlier which of course covers the adjustable hop unit. It should be noted that unlike many ‘budget’ AEG’s this AEG has a metal hop chamber unit which should be a little more robust than some plastic ones you sometimes see. The pistol grip is pretty standard but does feel nice in the palm of your hand and not as plastic as some brands. The motor is of course housed in the pistol grip and has a nice heat shield to aid in quick cooling. Under firing conditions we did notice the motor heating up but nothing unusual in that when running it on a 11.1 lipo or fully auto for a period of time. 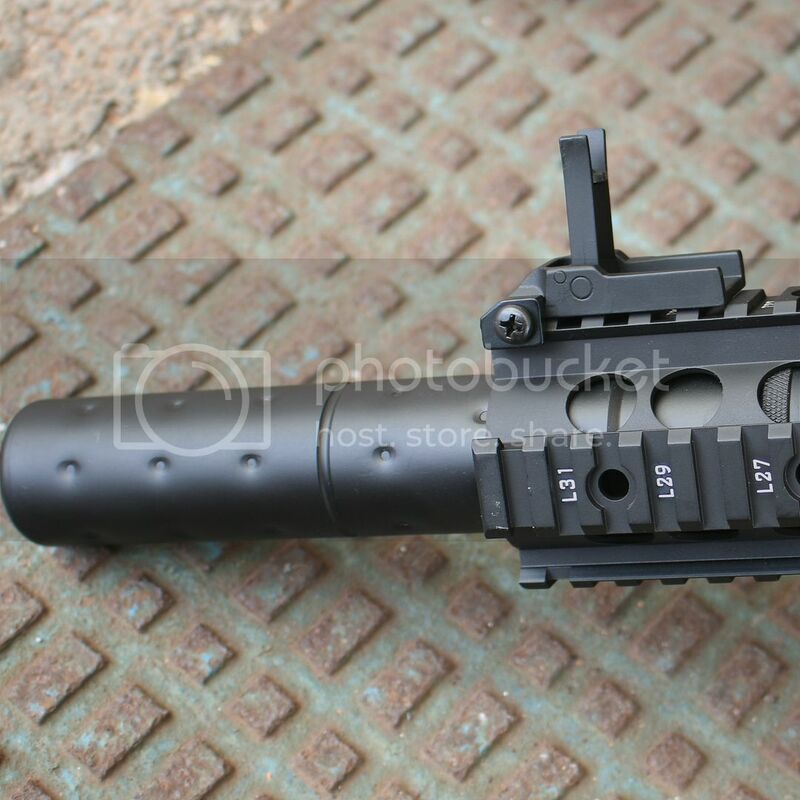 The front end of the AEG has an suppressor fitted which gives it a ‘fitted’ look and feel and this goes into the full RIS front end which is numbered and should have plenty of real estate for torches or other gear you want to fit to it. I was impressed, as often these rails have some wobble, but it’s absolutely wobble free and feels very solid indeed. 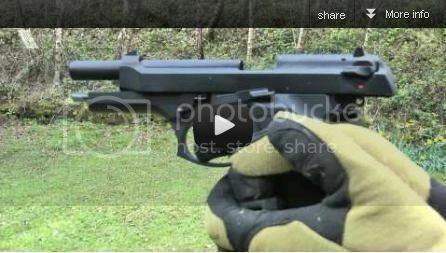 The RIS is continued on the upper receiver with a small gap from top receiver to front RIS. 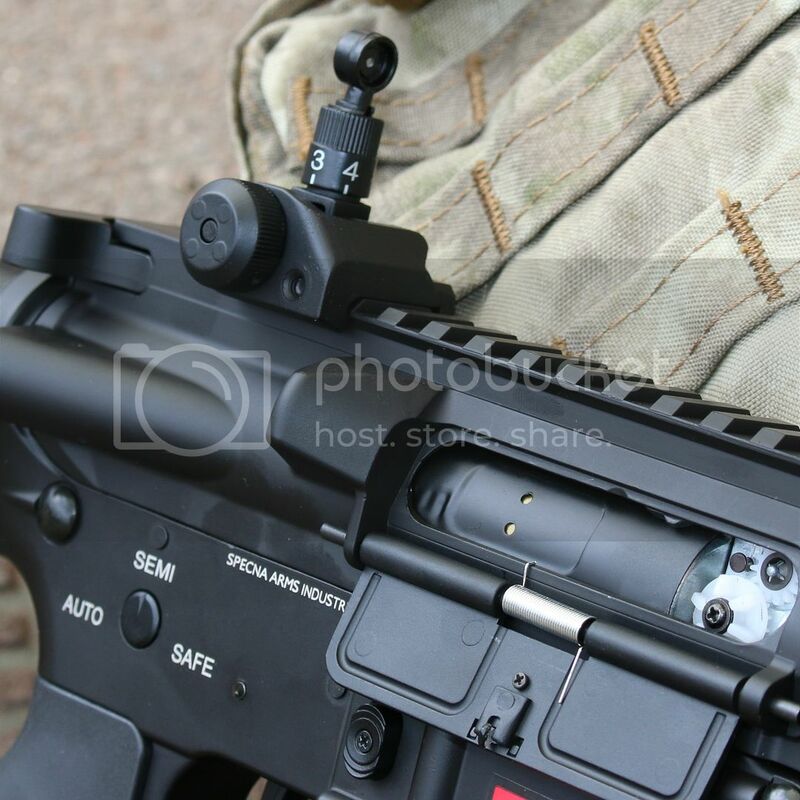 The rails are also fitted with flip up sights whilst the rear is adjustable for windage and elevation and nicely marked up whilst even the adjuster is easily accessible with players using gloves. 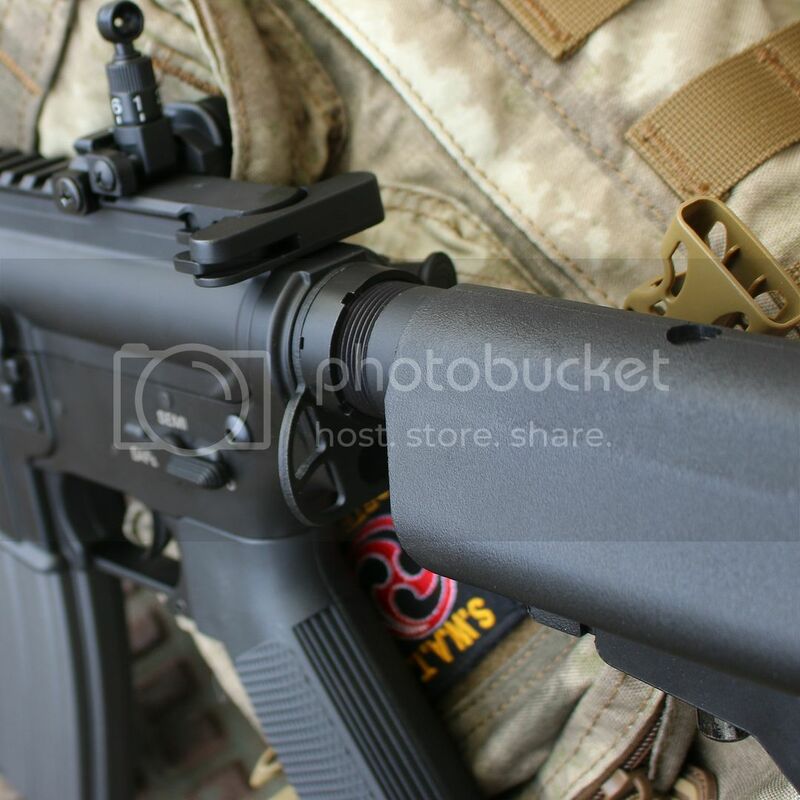 The AEG even boasts a sling attachment point on the rear of the receiver/stock tube. Internally it features a strong gearbox fitted with 8mm bearings and a polycarbonate piston with steel tooth in order to increase durability. The spring as standard can pump out a staggering 410 FPS (not really UK site friendly for indoor or outdoor use) but the ‘spare’ is a more suitable 310 FPS but the quick change makes swapping that out a doddle. The instruction manual that accompanies the AEG is much better than the stand we are used to but seasoned airsofters won’t need it. 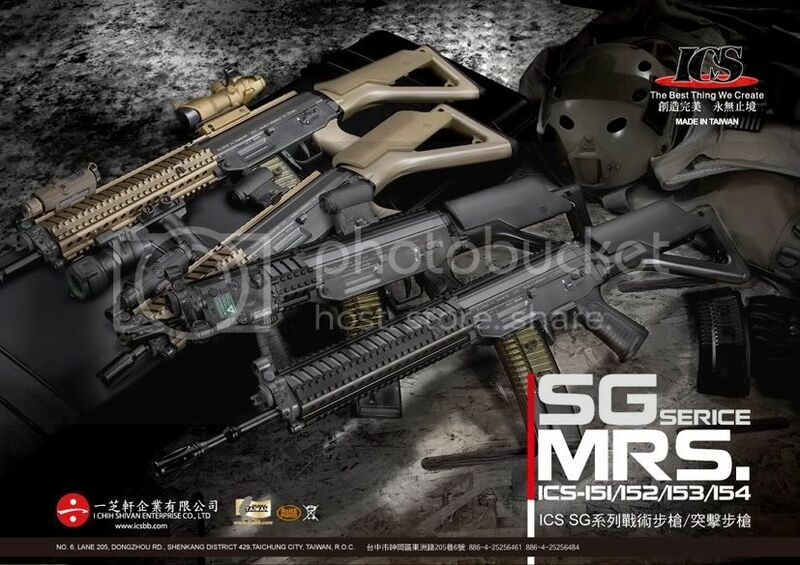 I must add that in play and to some players the trigger pull could seem a little hard, but for me I don’t like a hair trigger so the trigger pressure required was good and so far I’ve yet to find a standard M4 magazine that this AEG won’t take. The RIS accommodated a torch easily along with a host of other accessories. It kept going for the full day despite long sessions in semi-only firing mode and with a Lipo installed will empty your average hi-cap very quickly indeed. 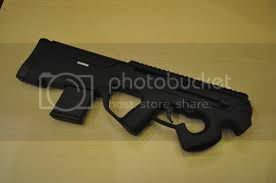 I also had no misfeeds or jams which can be unusual for a new airsoft aeg straight out of the box with little to no adjustments having to be made. 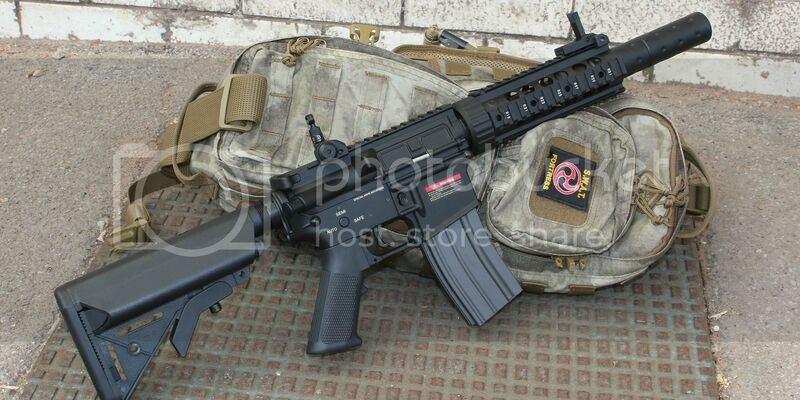 It’s fair to say I really like this aeg and would recommend it to anyone looking for a value aeg on a limited budget. Yosser says: Out of the box this AEG was a dream to use. Flawless in operation, it didn’t miss a beat all day. 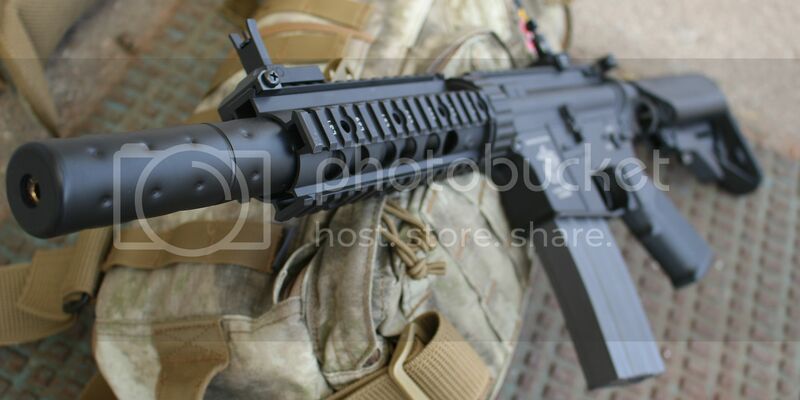 I was seriously impressed by the quality of this AEG for its price point at a little under £170 – yep that’s right a top quality AEG for sub 200 quid – what a result and available from our friends at Gunfire, they even put in a full inspection and fire test report before shipping it to you. 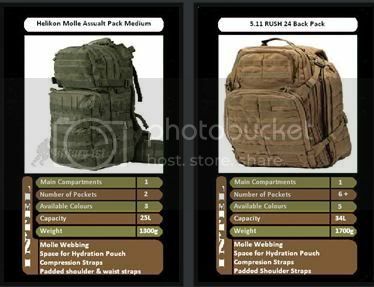 – I will definitely give Specna Arms AEG’s serious consideration for future purchases and beware other manufacturers – you will need to raise your game to keep up with these bad boys of airsoft. For price and quality you’ll be hard pressed to equal them. 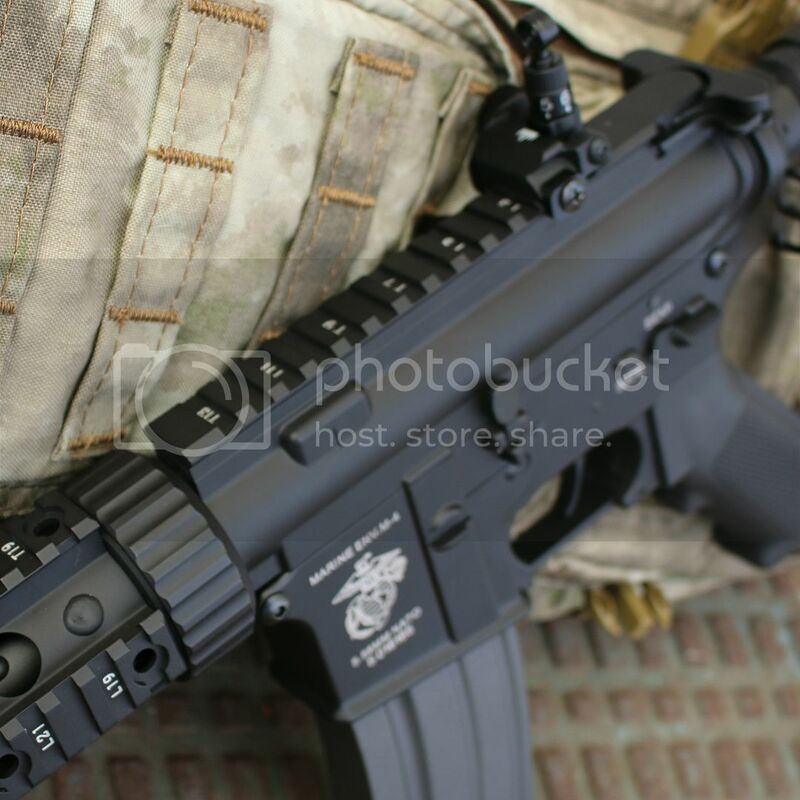 Recommendation – add a SA aeg to your armoury! 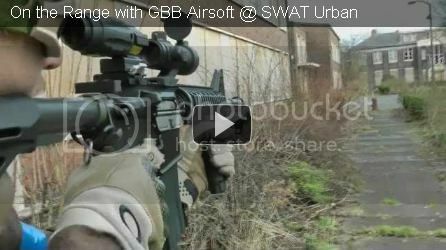 Check out the Airsoft Odyssey video review of this AEG HERE!